A color model is a way of describing and specifying a color. The term is often used loosely to refer to both a color space system and the color space on which it is based. A file format or file type is the form in which computer data is stored. Since a file is stored by an operating system as a linear series of bytes, which cannot describe many kinds of real data in an obvious way, conventions have been developed for interpreting the information as representations of complex data. All of the conventions for a particular “kind” of file constitute a file format. An Alpha value indicates the transparency of a pixel. Besides its Red, Green and Blue values, a pixel has an alpha value. The smaller the alpha value of a pixel, the more visible the colors below it. A pixel with an alpha value of 0 is completely transparent. A pixel with an alpha value of 255 is fully opaque. With some image file formats, you can only specify that a pixel is completely transparent or completely opaque. Other file formats allow a variable level of transparency. An alpha channel of a layer is a grayscale image of the same size as the layer representing its transparency. For each pixel the gray level (a value between 0 and 255) represents the pixels's Alpha value. An alpha channel can make areas of the layer to appear partially transparent. That's why the background layer has no alpha channel by default. The image alpha channel, which is displayed in the channels dialog, can be considered as the alpha channel of the final layer when all layers have been merged. See also Example for Alpha channel. An image hose in GIMP is a special type of brush which consists of several images. For example, you could have a brush with footprints, which consists of two images, one for the left footprint and one for the right. While painting with this brush, a left footprint would appear first, then a right footprint, then a left one, etc. This type of brush is very powerful. For information concerning creating an image hose, please see the Using Animated Brushes and Using Brushes sections. For information concerning creating an image hose, please see the Paragraaf 8, “The GIH Dialog Box” and Paragraaf 7, “Adding New Brushes”. Antialiasing is the process of reversing an alias, that is, reducing the “jaggies”. Antialiasing produces smoother curves by adjusting the boundary between the background and the pixel region that is being antialiased. Generally, pixel intensities or opacities are changed so that a smoother transition to the background is achieved. With selections, the opacity of the edge of the selection is appropriately reduced. At any time, a tile may be in main memory, in the tile cache in RAM, or on disk. Tiles which are currently being worked on are in main memory. Tiles which have been used recently are in RAM. When the tile cache in RAM is full, tiles which have been used least recently are written to disk. GIMP can retrieve the tiles from RAM or disk when they are needed. A spline is a curve which is defined mathematically and has a set of control points. A Bézier spline is a cubic spline which has four control points, where the first and last control points (knots or anchors) are the endpoints of the curve and the inner two control points (handles) determine the direction of the curve at the endpoints. In the non-mathematical sense, a spline is a flexible strip of wood or metal used for drawing curves. Using this type of spline for drawing curves dates back to shipbuilding, where weights were hung on splines to bend them. The outer control points of a Bézier spline are similar to the places where the splines are fastened down and the inner control points are where weights are attached to modify the curve. Bézier splines are only one way of mathematically representing curves. They were developed in the 1960s by Pierre Bézier, who worked for Renault. Bézier curves are used in GIMP as component parts of Paths. The image above shows a Bézier curve. Points P0 and P3 are points on the Path, which are created by clicking with the mouse. Points P1 and P2 are handles, which are automatically created by GIMP when you stretch the line. Color depth is simply the number of bits used to represent a color (bits per pixel : bpp). There are 3 channels for a pixel (for Red, Green and Blue). GIMP can support 8 bits per channel, referred as eight-bit color. So, GIMP color depth is 8 * 3 = 24, which allows 256 * 256 * 256 = 16,777,216 possible colors (8 bits allow 256 colors). Bump mapping is only one (very effective) way of simulating surface irregularities which are not actually contained in the geometry of the model. A channel masks is a special type of mask which determines the transparency of a selection. See Layer Mask : Every layer can have its own mask. The layer mask represents the Alpha channel of the layer and allows you to manage its transparency. By painting on the layer mask, you can make parts of the layer opaque or transparent: painting with black makes the layer transparent, painting with white makes the layer opaque and painting with shades of gray makes the layer semi-transparent. You can use all paint tools to paint on the mask. You can also apply a filter or copy-paste. You can use the Layer mask for transition effects, volume effects, merging elements from another image, etc. See the Layer Mask section for more details. for a detailed description. Afbeelding 1061. It is easy to see that no light (0R+0G+0B) produces complete darkness, black, and that full light (255R+255G+255B) produces white. Equal intensity on all color channels produces a level of gray. That is why there can only be 256 gray levels in GIMP. Mixing a primary color with its complementary color gives gray (a neutral color). It is important to know what happens when you are dealing with colors in GIMP. The most important rule to remember is that decreasing the intensity of a primary color results in increasing the intensity of the complementary color (and vice versa). This is because when you decrease the value of a channel, for instance Green, you automatically increase the relative importance of the other two, here Red and Blue. The combination of these two channels gives the secondary color, Magenta, which is the complementary color of Green. Exercise : You can check this out. Create a new image with only a white background (255R+255G+255B). Open the Tools → Color Tools → Levels dialog and select the Red channel. If necessary, check the preview box. Move the white slider to the left to decrease the Red value. You will notice that the background of your image gets closer and closer to Cyan. Now, decrease the Blue channel: only the Green will remain. For practice, go backwards, add a color and try to guess what hue will appear. The Color Picker tool lets you find out the RGB values of a pixel and the hextriplet for the color. Sample Merged is an option you can set when you use the Bucket Fill tool, the Color Picker tool and various selection tools. It is useful when you are working on an image with several layers and the active layer is either semi-transparent or has a Layer Mode which is not set to Normal. When you check the Sample Merged option, the color which is used for the operation is the composite color of all the visible layers. When the Sample Merged option is not checked, the color used is the color of the active layer itself. The last of these values, K (Black), doesn't contribute to the color, but merely serves to darken the other colors. The letter K is used for Black to prevent confusion, since B usually stands for Blue. Afbeelding 1059. This is the mode used in printing. These are the colors in the ink cartridges in your printer. It is the mode used in painting and in all the objects around us, where light is reflected, not emmitted. Objects absorb part of the light waves and we see only the reflected part. Note that the cones in our eyes see this reflected light in RGB mode. An object appears Red because Green and Blue have been absorbed. Since the combination of Green and Blue is Cyan, Cyan is absorbed when you add Red. Conversely, if you add Cyan, its complementary color, Red, is absorbed. This system is subtractive. If you add Yellow, you decrease Blue, and if you add Magenta, you decrease Green. 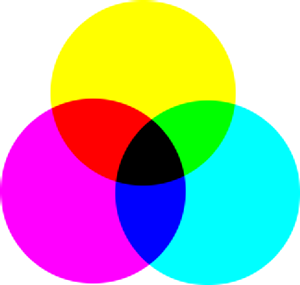 It would be logical to think that by mixing Cyan, Magenta and Yellow, you would subtract Red, Green and Blue, and the eye would see no light at all, that is, Black. But the question is more complex. In fact, you would see a dark brown. That is why this mode also has a Black value, and why your printer has a Black cartridge. It is less expensive that way. The printer doesn't have to mix the other three colors to create an imperfect Black, it just has to add Black. The Newsprint filter uses dithering as well. You can use the NL Filter (Non Linear filter) to remove unwanted dithering noise from your image. Also note that although GIMP itself uses 24-bit colors, your system may not actually be able to display that many colors. If it doesn't, then the software in between GIMP and your system may also dither colors while displaying them. See also the glossary entry on Floyd-Steinberg dithering, which is used in GIMP. This rendering intent is typically used for photographic content. It scales one gamut to fit into the other while maintaining the relative position of colors. YUV is a color model which uses two components to represent the color information, luma (the strength of the light per area) and the chrominance, or proportion of color (chroma), where the chrominance again consists of two components. The development of the YUV color model also goes back to the development of color television (PAL), where ways were sought for transmitting the color information along with the black-and-white signal, in order to achieve backwards compatibility with old black and white televisions without having to increase the available transmission bandwidth. From the YUV color model of the analog television techiques, the YCrCb color model was developed, which is used for most kinds of digital image and video compression. Erroneously, the YUV color model is also often spoken about in those fields, although the YCbCr model is actually used. This often causes confusion. For the calculation of the luma signals, the underlying RGB data is first adjusted with the gamma value of the output device, and an R'G'B' signal is obtained. The three individual components are added together with different weights, to form the brightness information, which also functions as the VBS signal (Video Baseband Signal, the black-and-white signal) for the old black and white televisions. The YCbCr model is a slight adaptation of such a brightness-color model. An RGB color value is divided into a basic brightness, Y, and two components, Cb and Cr, where Cb is a measurement of the deviation from gray in the blue direction, or if it is less than 0.5, in the direction of yellow. Cr is the corresponding measurement for the difference in the direction of red or turquoise. This representation uses the peculiarity of the eye of being especially sensitive to green light. That is why most of the information about the proportion of green is in the basic brightness, Y, an only the deviations for the red and blue portions need to be represented. The Y values have twice the resolution of the other two values, Cb and Cr, in most practical applications, such as on DVDs. Furthermore, because of the structure of the retina of the human eye, it turns out that the brightness information is perceived at a higher resolution than the color, so that many formats based on the YUV color model compress the chrominance to save bandwidth during transmission. Exchangeable image file format (official abbreviation Exif, not EXIF) is a specification for the image file format used by digital cameras. It was created by the Japan Electronic Industry Development Association (JEIDA). The specification uses the existing JPEG, TIFF Rev. 6.0, and RIFF WAVE file formats, with the addition of specific metadata tags. It is not supported in JPEG 2000 or PNG. Version 2.1 of the specification is dated June 12, 1998 and version 2.2 is dated April 2002. The Exif tag structure is taken from that of TIFF files. There is a large overlap between the tags defined in the TIFF, Exif, TIFF/EP and DCF standards [WKPD-EXIF]. A floating selection (sometimes called a “floating layer”) is a type of temporary layer which is similar in function to a normal layer, except that a floating selection must be anchored before you can resume working on any other layers in the image. In early versions of GIMP, when GIMP did not use layers, floating selections were used for performing operations on a limited part of an image (you can do that more easily now with layers). Now floating selections have no practical use, but you must know what you have to do with them. Floyd-Steinberg dithering is a method of dithering which was first published in 1976 by Robert W. Floyd and Louis Steinberg. The dithering process begins in the upper left corner of the image. For each pixel, the closest available color in the palette is chosen and the difference between that color and the original color is computed in each RGB channel. Then specific fractions of these differences are dispersed among several adjacent pixels which haven't yet been visited (below and to the right of the original pixel). Because of the order of processing, the procedure can be done in a single pass over the image. Bump mapping is a technique for displaying extremely detailed objects without increasing the geometrical complexity of the objects. It is especially used in 3-dimensional visualization programs. The trick is to put all the necessary information into a texture, with which shadowing is shown on the surface of the object. The great power of PostScript is its ability to represent vector graphics—lines, curves, text, paths, etc.—in a resolution-independent way. PostScript is not very efficient, though, when it comes to representing pixel-based raster graphics. For this reason, PostScript is not a good format to use for saving images that are later going to be edited using GIMP or another graphics program. bitmap — A data file or structure which corresponds bit for bit with an image displayed on a screen, probably in the same format as it would be stored in the display's video memory or maybe as a device independent bitmap. A bitmap is characterised by the width and height of the image in pixels and the number of bits per pixel which determines the number of shades of grey or colors it can represent. A bitmap representing a colored image (a “pixmap”) will usually have pixels with between one and eight bits for each of the red, green, and blue components, though other color encodings are also used. The green component sometimes has more bits than the other two to cater for the human eye's greater discrimination in this component. Gamma or gamma correction is a non-linear operation which is used to encode and decode luminance or color values in video or still image systems. It is used in many types of imaging systems to straighten out a curved signal-to-light or intensity-to-signal response. For example, the light emitted by a CRT is not linear with regard to its input voltage, and the voltage from an electric camera is not linear with regard to the intensity (power) of the light in the scene. Gamma encoding helps to map the data into a perceptually linear domain, so that the limited signal range (the limited number of bits in each RGB signal) is better optimized perceptually. For PC video, images are encoded with a gamma of about 0.45 and decoded with a gamma of 2.2. For Mac systems, images are typically encoded with a gamma of about 0.55 and decoded with a gamma of 1.8. The sRGB color space standard used for most cameras, PCs and printers does not use a simple exponential equation, but has a decoding gamma value near 2.2 over much of its range. In GIMP, gamma is an option used in the brush tab of the GIMPressionist filter and in the Flame filter. The display filters also include a Gamma filter. Also see the Levels Tool, where you can use the middle slider to change the gamma value. GIF™ stands for Graphics Interchange Format. It is a file format with good, lossless compression for images with low color depth (up to 256 different colors per image). Since GIF was developed, a new format called Portable Network Graphics (PNG) has been developed, which is better than GIF in all respects, with the exception of animations and some rarely-used features. Colors in GIF are stored in a color table which can hold up to 256 different entries, chosen from 16.7 million different color values. When the image format was introduced, this was not a much of a limitation, since only a few people had hardware which could display more colors than that. For typical drawings, cartoons, black-and-white photographs and similar uses, 256 colors are quite sufficient as a rule, even today. For more complex images, such as color photographs, however, a huge loss of quality is apparent, which is why the format is not considered to be suitable for those purposes. One color entry in the palette can be defined to be transparent. With transparency, the GIF image can look like it is non-rectangular in shape. However, semi-transparency, as in PNG, is not possible. A pixel can only be either entirely visible or completely transparent. The first version of GIF was 87a. In 1989, CompuServe published an expanded version, called 89a. Among other things, this made it possible to save several images in one GIF file, which is especially used for simple animation. The version number can be distinguished from the first six bytes of a GIF file. Interpreted as ASCII symbols, they are “GIF87a” or “GIF89a”. The GNU project was started in 1983 by Richard Stallman with the goal of developing a completely free operating system. It is especially well-known from the GNU General Public License (GPL) and GNU/Linux, a GNU-variant with a Linux kernel. GIMP uses the process of Feathering to make a smooth transition between a region and the background by softly blending the edges of the region. The process of Feathering makes a smooth transition between a region and the background by softly blending the edges of the region. If incremental mode is not set, brush strokes are drawn on a canvas buffer, which is then combined with the active layer. The maximum effect of a brush is then determined by the opacity, and stroking with the brush repeatedly does not increase the effect beyond this limit. Incremental mode is a tool option that is shared by several brush tools, except those which have a “rate” control, which automatically implies an incremental effect. You can set it by checking the Incremental checkbox in the toolbox for the tool (Paintbrush, Pencil and Eraser). The two images above were created using a brush with spacing set to 60 percent. The image on the left shows non-incremental painting and the image on the right shows the difference with incremental painting. Incremental mode is a tool option that is shared by several brush tools, except those which have a “rate” control, which automatically implies an incremental effect. You can set it by checking the Incremental checkbox in the tool option dialog for the tool (Paintbrush, Pencil and Eraser). In digital image processing, a histogram is a graph representing the statistical frequency of the gray values or the color values in an image. The histogram of an image tells you about the occurrence of gray values or color values, as well as the contrast range and the brightness of the image. In a color image, you can create one histogram with information about all possible colors, or three histograms for the individual color channels. The latter makes the most sense, since most procedures are based on grayscale images and therefore further processing is immediately possible. HSV is a color model which has components for Hue (the color, such as blue or red), Saturation (how strong the color is) and Value (the brightness). None (sometimes called “Nearest Neighbor”): The color of each pixel is copied from its closest neighboring pixel in the original image. This often results in aliasing (the “stair-step” effect) and a coarse image, but it is the fastest method. When the image is displayed, GIMP puts these components together to form the pixel colors for the screen, printer, or other output device. Some output devices may use different channels from Red, Green and Blue. If they do, GIMP's channels are converted into the appropriate ones for the device when the image is displayed. Channels can be useful when you are working on an image which needs adjustment in one particular color. For example, if you want to remove “red eye” from a photograph, you might work on the Red channel. You can look at channels as masks which allow or restrict the output of the color that the channel represents. By using Filters on the channel information, you can create many varied and subtle effects on an image. A simple example of using a Filter on the color channels is the Channel Mixer filter. In addition to these channels, GIMP also allows you to create other channels (or more correctly, Channel Masks), which are displayed in the lower part of the Channels dialog. You can convert a selection to a channel mask by using the Save to Channel command. You can also create a channel by right-clicking in the Channels dialog and using the New channel command. See the glossary entry on Masks for more information about Channel Masks. The Clipboard is a temporary area of memory which is used to transfer data between applications or documents. It is used when you Cut, Copy or Paste data in GIMP. The Lab color space (also called the L*a*b* color space) is a color model developed in the beginning of the 1930s by the Commission Internationale d`Eclairage (CIE). It includes all the colors that the human eye can perceive. That contains the colors of the RGB and the CMYK color spaces, among others. In Lab, a color is indicated by three values: L, a and b. Here, the L stands for the luminance component — corresponding to the gray value — and a and b represent the red-green and blue-yellow parts of the color, respectively. Layer Mask : Every layer can have its own mask. The layer mask represents the Alpha channel of the layer and allows you to manage its transparency. By painting on the layer mask, you can make parts of the layer opaque or transparent: painting with black makes the layer transparent, painting with white makes the layer opaque and painting with shades of gray makes the layer semi-transparent. You can use all paint tools to paint on the mask. You can also apply a filter or copy-paste. You can use the Layer mask for transition effects, volume effects, merging elements from another image, etc. See the Layer Mask section for more details. The moiré effect (pronounce “Moa-ray”)is an unintended pattern which appears when a regular pattern of grids or lines interferes with another regular pattern placed over it. This can happen, for example, when you are scanning an image with a periodic structure (such as a checkered shirt or a half-toned image), scanning a digital image, taking a digital photograph of a periodic pattern, or even when silkscreening. Layer Mask: Every layer can have its own mask. The layer mask represents the Alpha channel of the layer and allows you to manage its transparency. By painting on the layer mask, you can make parts of the layer opaque or transparent: painting with black makes the layer transparent, painting with white makes the layer opaque and painting with shades of gray makes the layer semi-transparent. You can use all paint tools to paint on the mask. You can also apply a filter or copy-paste. You can use the Layer mask for transition effects, volume effects, merging elements from another image, etc. See the Layer Mask section for more details. If you cannot re-create the image file, GIMP offers some filters which may help you with the problem. For more information, see the Despeckle and NL Filter (Non-Linear) filters. Linear (sometimes called “Bilinear”): The color of each pixel is computed as the average color of the four closest pixels in the original image. This gives a satisfactory result for most images and is a good compromise between speed and quality. Interpolation means calculating intermediate values. When you enlarge (“digitally zoom”) or otherwise transform (rotate, shear or give perspective to) a digital image, interpolation procedures are used to compute the colors of the pixels in the transformed image. GIMP offers three interpolation methods, which differ in quality and speed. In general, the better the quality, the more time the interpolation takes (see Interpolation methods). GIMP uses interpolation when you Scale an image, Scale a layer, and when you Transform an image. Download one of the prepared Windows distributions, such as gs650w32.exe or gs700w32.exe. Start the executable and follow the instructions of the installation procedure. The moiré effect (pronounce “Moa-ray”) is an unintended pattern which appears when a regular pattern of grids or lines interferes with another regular pattern placed over it. This can happen, for example, when you are scanning an image with a periodic structure (such as a checkered shirt or a half-toned image), scanning a digital image, taking a digital photograph of a periodic pattern, or even when silkscreening. A Parasite is additional data which may be written to an XCF file. A parasite is identified by a name, and can be thought of as an extension to the other information in an XCF file. As explained in RGB mode, 24-bit GIMP images can have up to 256 levels of gray. If you change from Grayscale to RGB mode, your image will have an RGB structure with three color channels, but of course, it will still be gray. When you create a new image, you can choose to create it in Grayscale mode (which you can colorize later, by changing it to RGB mode). You can also change an existing image to grayscale by using the Grayscale, Desaturate, Decompose, Channel Mixer, although not all formats will accept these changes. Although you can create images in Grayscale mode and convert images to it, it is not a color model, in the true sense of the word. A mask is like a veil put over a layer (layer mask) or all the layers of an image (selection mask). You can remove this mask by painting with white color, and you can complete it by painting with black color. When the mask is “applied”, non masked pixels will remain visible (the others will be transparent) or will be selected, according to the type of mask. Parasites of an image component may be read by GIMP plug-ins. Plug-ins may also define their own parasite names, which are ignored by other plug-ins. Examples of parasites are comments, the save options for the TIFF, JPEG and PNG file formats, the gamma value the image was created with and EXIF data. All of the functions which GIMP and its extensions make available are registered in the Procedure Database (PDB). Developers can look up useful programming information about these functions in the PDB by using the Procedure Browser. YCbCr is a color model which was developed for the PAL television standard as a simple modification to the YUV color model. In the meantime, it has become the CCIR-601 standard for image and video recording. For example, it is used for JPEG pictures and MPEG videos, and therefore also on DVDs, video CDs and for most other widespread digital video standards. 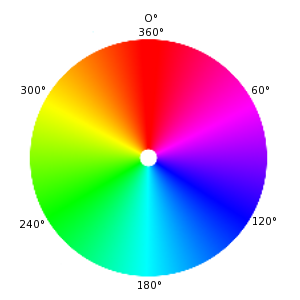 Note that a color model is still not a color space, since it doesn't determine which colors are actually meant by “red”, “green” and “blue”. For a color space, there must still be a reference to a specific absolute color value. There are color models which do not express a color by the additive basic colors, red, green and blue (RGB), but by other properties, for example, the brightness-color model. Here, the criteria are the basic brightness of the colors (from black, through gray, to white), the colors with the largest portion (red, orange, yellow, green, blue, violet, or other pure colors that lie between them) and the saturation of the colors (“gaudy” to pale). This color model is based on the ability of the eye to recognize small differences in luminosity better than small color differences, and to recognize those better than small differences in saturation. That makes gray text written on a black background easy to read, but blue text on a red background very hard to read, even with the same basic brightness. Such color models are called brightness-color models. The YCbCr model is a slight adaptation of such a brightness-color model. An RBG color value is divided into a basic brightness, Y, and two components, Cb and Cr, where Cb is a measurement of the deviation from gray in the blue direction, or if it is less that 0.5, in the direction of yellow. Cr is the corresponding measurement for the difference in the direction of red or turquoise. This representation uses the peculiarity of the eye of being especially sensitive to green light. That is why most of the information about the proportion of green is in the basic brightness, Y, an only the deviations for the red and blue portions need to be represented. The Y values have twice the resolution of the other two values, Cb and Cr, in most practical applications, such as on DVDs. PDF (Portable Document Format) is a file format which was developed by Adobe to address some of the deficiencies of PostScript. Most importantly, PDF files tend to be much smaller than equivalent PostScript files. As with PostScript, GIMP's support of the PDF format is through the free Ghostscript libraries. PSD is Adobe Photoshop's native file format, and it is therefore comparable to XCF in complexity. GIMP's ability to handle PSD files is sophisticated but limited: some features of PSD files are not loaded, and only older versions of PSD are supported. Unfortunately, Adobe has now made the Photoshop Software Development Kit — which includes their file format specifications — proprietary, and only available to a limited set of developers approved by Adobe. This does not include the GIMP development team, and the lack of information makes it very difficult to maintain up-to-date support for PSD files. One way to reduce quantization effects is to use Dithering. The operations in GIMP which perform dithering are the Blend tool (if you have enabled the dithering option) and the Convert to Indexed command. However, they only work on RGB images and not on Indexed images. This method is typically used for business graphics. The relative saturation of colors is mostly maintained, but lightning is usually changed. This rendering intent is most often used in proofing. It preserves the native device white point of the source image. One way to reduce the space and time requirement is to use Adaptive Supersampling. This method takes advantage of the fact that very few pixels are actually on an object boundary, so only those pixels need to be supersampled. At first, only a few samples are taken within a pixel. If the colors are very similar to each other, only those samples are used to calculate the final color. If not, more samples are used. This means that the higher number of samples is calculated only where necessary, which improves performance. This term refers to color purity. Imagine you add pigment to white paint. Saturation varies from 0 (white, fully toned down, fully diluted) to 100 (pure color). SVG stands for Scalable Vector Graphics. It a format for two-dimensional vector graphics, both static and animated. You can export GIMP paths to SVG and you can import SVG documents into GIMP from a vector graphic software. See [WKPD-SVG] for more details. SVG stands for Scalable Vector Graphics. It is a format for two-dimensional vector graphics, both static and animated. You can export GIMP paths to SVG and you can import SVG documents into GIMP from a vector graphic software. See [WKPD-SVG] for more details. TGA (TARGA Image File) is a file format which supports 8, 16, 24 or 32 bits per pixel and optional RLE compression. It was originally developed by the Truevision company. “TGA” stands for Truevision Graphics Adapter and “TARGA” stands for Truevision Advanced Raster Graphics Adapter. 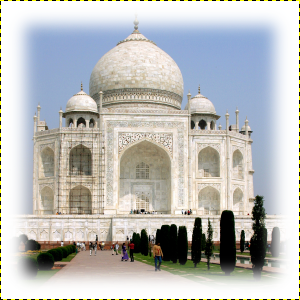 A Tile is a part of an image which GIMP currently has open. In order to avoid having to store an entire image in memory at the same time, GIMP divides it into smaller pieces. A tile is usually a square of 64 x 64 pixels, although tiles at the edges of an image may be smaller than that. The clipboard is implemented slightly differently under different operating systems. Under Linux/XFree, GIMP uses the XFree clipboard for text and the GIMP internal image clipboard for transferring images between image documents. Under other operating systems, the clipboard may work somewhat differently. See the GIMP documentation for your operating system for further information. The basic operations provided by the clipboard are “Cut”, “Copy”, and “Paste”. Cut means that the item is removed from the document and copied to the clipboard. Copy leaves the item in the document and copies it to the clipboard. Paste copies the contents of the clipboard to the document. The GIMP makes an intelligent decision about what to paste depending upon the target. If the target is a canvas, the Paste operation uses the image clipboard. If the target is a text entry box, the paste operation uses the text clipboard. Marching ants is a term which describes the dotted line which surrounds a selection. The line is animated, so it looks as if little ants are running around behind each other. You can disable the marching ants by unchecking the View → Show Selection option or by using the keyboard shortcut Ctrl+T. The name came about from the naming conventions which were in practice at MIT, where Stallman worked at the time. For programs which were similar to other programs, recursive acronyms were chosen as names. Since the new system was to be based on the widespread operating system, Unix, Stallman looked for that kind of name and came up with GNU, which stands for “GNU is not Unix”. In order to avoid confusion, the name should be pronounced with the “G”, not like “new”. There were several reasons for making GNU Unix-compatible. For one thing, Stallman was convinced that most companies would refuse a completely new operating system, if the programs they used wouldn't run on it. In addition, the architecture of Unix made quick, easy and distributed development possible, since Unix consists of many small programs that can be developed independently of each other, for the most part. 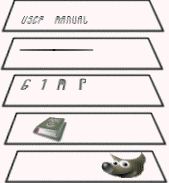 Also, many parts of a Unix system were freely available to anyone and could therefore be directly integrated into GNU, for example, the typesetting system, TeX, or the X Window System. The missing parts were newly written from the ground up. GIMP (GNU Image Manipulation Program) is an official GNU application [WKPD-GNU]. A Uniform Resource Identifier (URI) is a string of characters that serves to identify an abstract or a physical resource. URIs are used for the identification of resources in the Internet (such as web pages, miscellaneous files, calling up web services, and for receivers of e-mail) and they are especially used in the Worldwide Web. URLs (Uniform Resource Locators) are one type of Uniform Resource Identifiers (URIs). URLs identify a resource by its primary access mechanism (commonly http or ftp) and the location of the resource in the computer network. The name of the URI scheme is therefore generally derived from the network protocol used for it. Examples of network protocols are http, ftp and mailto. Other formats, such as GIF, PNG or JBIG, are far better for these kinds of images. In general, JPEG transformations are not reversible. Opening and then saving a JPEG file causes a new, lossy compression. Increasing the quality factor later will not bring back the image information which was lost. The Lab color space (also called the L*a*b color space) is a color model developed in the beginning of the 1930s by the Commission Internationale d`Eclairage (CIE). It includes all the colors that the human eye can perceive. That contains the colors of the RGB and the CMYK color spaces, among others. In Lab, a color is indicated by three values: L, a and b. 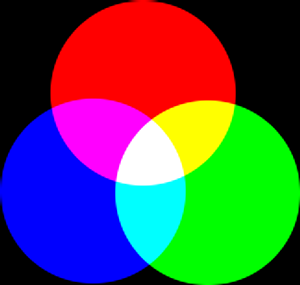 Here, the L stands for the luminance component — corresponding to the gray value — and a and b represent the red-green and blue-yellow parts of the color, respectively. In contrast to RGB or CMYK, Lab is not dependent upon the various input and output devices. For that reason, it is used as an exchange format between devices. Lab is also the internal color model of PostScript Level II. You can also create a guide with the New Guide command, which allows you to precisely place the guide on the image, the New Guide (by Percent) command, or the New Guides from Selection command. For more information see Paragraaf 2.2, “Hulplijnen”. This term often refers to the light intensity, the luminosity of a color. It varies from 0 (black) to 100 (full light). Saturation : This value describes how pale the color is. A completely unsaturated color is a shade of gray. As the saturation increases, the color becomes a pastel shade. A completely saturated color is pure. Saturation values go from 0 to 100, from white to the purest color. This value describes how pale the color is. A completely unsaturated color is a shade of gray. As the saturation increases, the color becomes a pastel shade. A completely saturated color is pure. Saturation values go from 0 to 100, from white to the purest color. This value describes the luminosity, the luminous intensity. It is the amount of light emitted by a color. You can see a change of luminosity when a colored object is moved from being in the shadow to being in the sun, or when you increase the luminosity of your screen. Values go from 0 to 100. Pixel values in the three channels are also luminosities: “Value” in the HSV color model is the maximum of these elementary values in the RGB space (scaled to 0-100).